I’m doing a special Meet, Greet and Cookbook Giveaway with Canyon Bakehouse at Expo West. 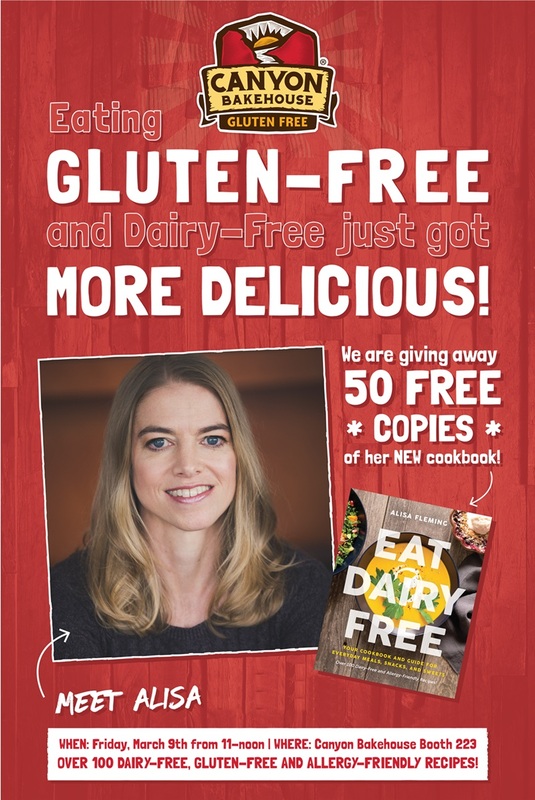 They are sponsoring 50 Free Copies of my new cookbook, Eat Dairy Free, which I will be on hand to sign. Just swing by the Canyon Bakehouse booth between 11am and noon on Friday, March 9th and pick up your copy! While you are there, you can sample some of their amazing new gluten-free, dairy-free, and nut-free breads. Canyon Bakehouse will be conveniently located at Booth #223, in the entryway to the Arena. Canyon Bakehouse, a Colorado-based gluten-free bakery, is adding two new flavors to its Stay-Fresh Packaging line. Say Aloha to Hawaiian Sweet Bread and Honey Oat Bread! The Hawaiian Sweet Bread loaves are light and fluffy with a hint of sweetness that takes you to a tropical paradise. The new Honey Oat Bread is soft, chewy and packed with wholesome Certified Gluten-Free oats and a touch of honey. Plus, each loaf has just 2 to 3 grams of sugar per slice! Like all Canyon Bakehouse baked goods, they are Certified Gluten-Free, kosher and free from dairy, tree nuts, peanuts, soy and sesame. And, with Stay-Fresh Packaging, consumers can stock up and store them in their pantry. Stop by booth #223 at Expo West to sample these new breads and get your copy of Eat Dairy Free. For more information on Canyon Bakehouse, visit canyonglutenfree.com. 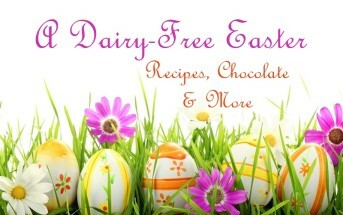 Eat Dairy Free is a “just dairy free” cookbook that also happens to be allergy-friendly. 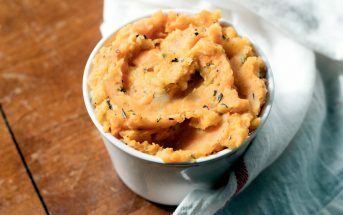 Every recipe has fully tested options for gluten-free, egg-free, peanut-free, and soy-free too! Eat Dairy Free includes 110 original recipes with a focus on affordable, healthy, accessible food. And it is full color! 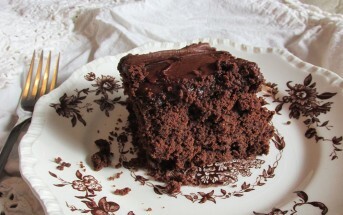 Every recipe includes a wonderful photo to help you get the best results. 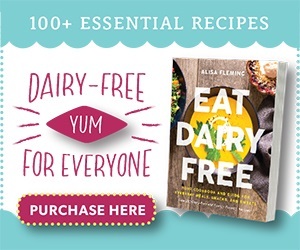 Alisa Fleming is the author of Eat Dairy Free and Go Dairy Free: The Guide and Cookbook. These are unique and completely different books. 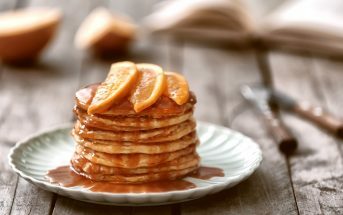 Alisa is also the founder of the leading dairy-free website and online magazine, Go Dairy Free, and Food Editor for the magazine, Allergic Living. I hope you had fun at the Expo. My goal is to go next year. Hopefully I’ll see you there. Hopefully and yes, it was great! I’m SO bummed you aren’t going Kristina! That honey oat bread would be so perfect for avocado toast with a bowl of soup! I would love to go to the Expo West. It would be such a great opportunity. Maybe next year! Oh, I hope so – you must go! That Hawaiian sweet bread has so many possibilities. Can’t wait to get my hands on some! I bet you’re going to love it Amanda. I wish I was going to Expo West! (It’s super far away from me.) This sounds like an amazing opportunity. Have a great time! Oh that’s a bummer. Well hopefully you can at least connect with Canyon and try those breads at an event closer to your home. I’m so excited for their new Hawaiian bread! And Expo West is going to be so exciting! This sounds like so much fun! I was I was going to Expo West. I’ve just great things about it. It’s such an amazing event Dianne! I have two! That is a bummer Hedi. 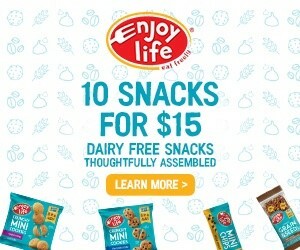 I need to make it to the UK – so many great dairy-free products and people there! Oh I cannot wait to try their Hawaiian bread! This bread is going to make someone very happy. A friend of ours has a daughter that loved Hawaiian bread and some dip until she had to cut out dairy and gluten. I can adapt a recipe for her for the dip but was always stuck on the bread piece. I am SO looking forward to trying that bread, too! Can’t wait to see your dip recipe also. I wish we could be there to say hi! Book looks wonderful! How exciting! Wish I could attend, I’m looking for local expos to check out this year. Well keep this one on your list for next year Jenna!! Probably not this time 🙁 You really do need to make it to the show Hannah one of these years! I just love your cookbook Alisa! SO many people are going to benefit from it. Thank you Nicole, you are so sweet! Oh indeed! Hoping you make it to the US for Expo West one year Kortney!